Yeah, ya know. I laugh at goofy stuff. Funny stuff. That's is exactly the kind of conversation we have here, only on purpose. Thanks for the morning laugh. 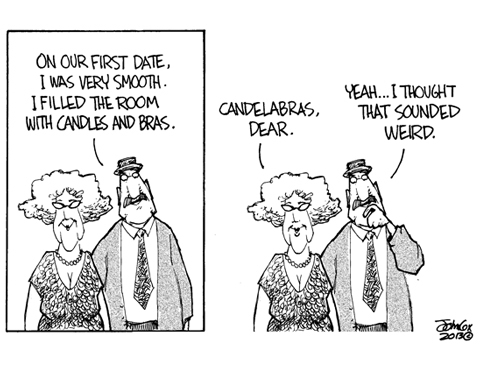 What also sounds weird is that "candelabrum" is technically the "proper" singular form & "candelabra" the plural. She had a BIG problem with the "accepted conversational" forms of "candelabra" & "candelabras" (along with a LOT of other things). Another little insight into how "T" got messed up. Yoww. Old school grammar. Thank goodness rigid rules of usage are about as helpful as fur on a kitchen sink. This page contains a single entry from the blog posted on April 8, 2013 1:22 AM. The previous post in this blog was Rogue Gallery. The next post in this blog is Computer Game Cover Illustration Idea.